Our Underground Drainage Systems, Leach Basins are dug by hand. No heavy duty equipment is used that can potentially damage your lawn, brick pavers, irrigation lines etc. Underground Drainage Systems. Island Gutters will install underground drainage systems when needed and when the customer requests it. A properly working drainage system is critical to maintaining value of your home. Underground drainage systems prevent erosion of your home foundation, helps you avoid excessive dampness, and mositure in in your basement. This can lead to mold, mildew that in some cases result in health problems and costly home repairs. What types of service does Island Gutters offer for underground drainage systems? 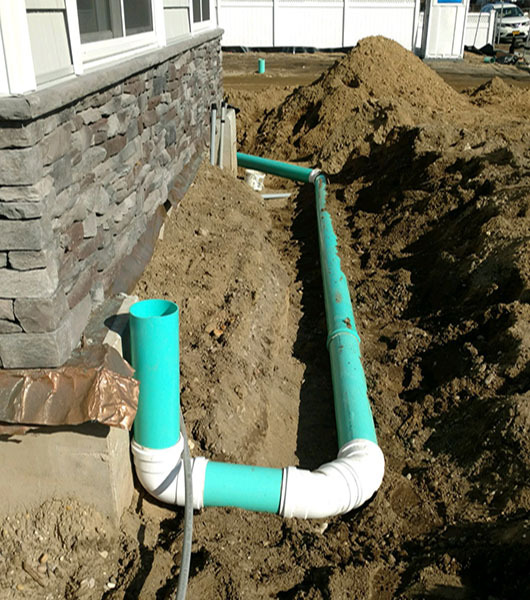 We install downspouts to direct water runoff away from your home foundation. Island Gutters pays attention to the specific requirements of your home including the type of roof, corners on your home, slope of the yard and other factors when evaluating your drainage requirements. We use downspouts that are large enough to handle heavy rainfalls. At Island Gutters we dig leach basins by hand. No heavy duty equipment is used and this helps avoid damage to your lawn, brick pavers or irrigation lines. 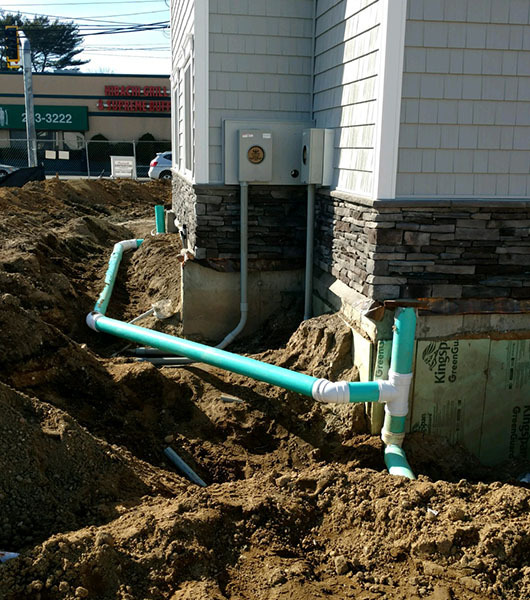 Island Guters has succesfully installed over 1,000 underground drainage systems on Long Island. For additional information on Underground Drainage Systems. Please call us at 631-498-8500 or 516-962-2100. Island Gutters Offers Complete Affordable Gutter and Leaf Protection Solutions for Homes & Businesses on Long Island. As part of the Long Island Construction Services Companies, we also offer Low Powered Outdoor LED Lighting Systems. Island Gutters has a low-cost but highly effective gutter system solution for every structure. We are a preferred Alcoa Leaf Relief Contractor. Babylon, Commack, Dix Hills, East Setauket, Huntington, Islip, Saint James, Smithtown, Stony Brook, Syosset and More.